The Cape Byron Lighthouse is located on the Cape Byron, Australia's the most easterly point of the mainland, near Byron Bay town. Cape Byron lighthouse was built in 1901 and for a century alerted passing ships to the dangers of the coast. In 1956 the light became Australia's most powerful lighthouse. 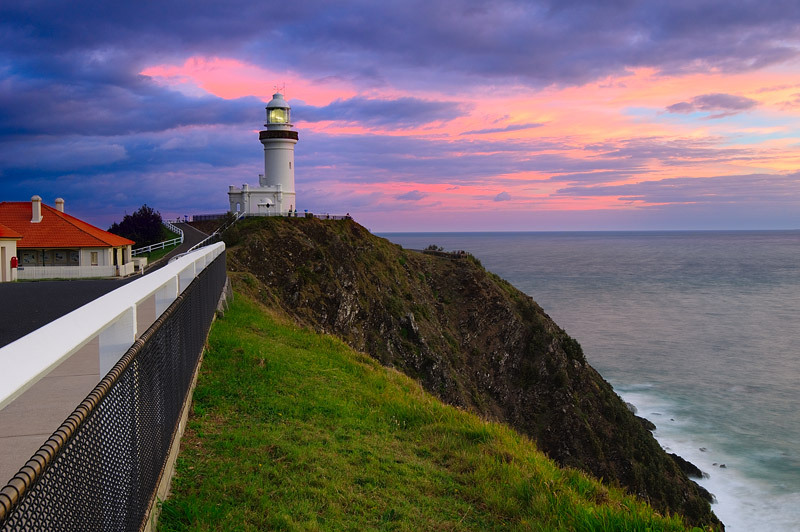 Byron Bay Lighthouse has become an icon for Byron Bay and is a must for any visitor to Byron Bay. Take an early-morning walk to see the sun come up over the Pacific, and watch the pink glow on the lighthouse turn to stark white in the morning sun. This image belongs to the travel and nature stock photo library. This stock photo of Storm Clouds above Cape Byron Lighthouse at Sunrise is available for licensing for commercial and editorial uses including websites, blogs, books, magazines, brochures and advertising. Restrictions may apply for images which contain third party copyrighted material or sensitive subjects. Photos of artwork are for editorial use only. This image id AU-BYRON-BAY-LIGHTHOUSE-0001 of Storm Clouds above Cape Byron Lighthouse at Sunrise, is copyrighted © by Ilya Genkin. This is not a public domain image.